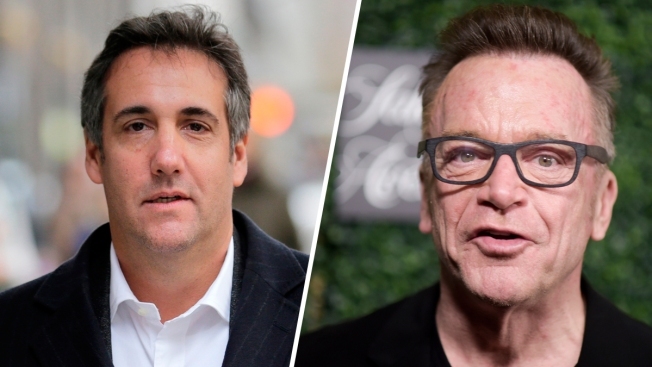 "This dude has all the tapes -- this dude has everything"
Tom Arnold (R), who is working on a show where he hunts for unflattering video of President Donald Trump, tweeted a photo with Michael Cohen Thursday night. He said Cohen "has all the tapes." Comedian Tom Arnold, who's working on a show with Vice that features him searching for unflattering video of President Donald Trump, tweeted a photo of himself with the president's embattled personal attorney, Michael Cohen, NBC News reported. Cohen retweeted the photo, which had a simple caption: "I love New York." He referred a request for comment to Arnold, who told NBC News, "It’s on! I hope he [Trump] sees the picture of me and Michael Cohen and it haunts his dreams." Arnold wouldn't say whether Cohen would provide him with any tapes he may have of conversations with Trump, but he said, "This dude has all the tapes -- this dude has everything."